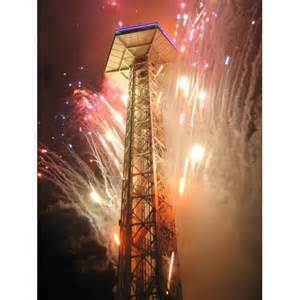 Gatlinburg will welcome the arrival of 2014 in unique style with its 26th Annual New Year’s Eve Ball Drop and Fireworks Show around the intersection of Parkway and Historic Nature Trail at the base of the Space Needle late Tuesday night, December 31. 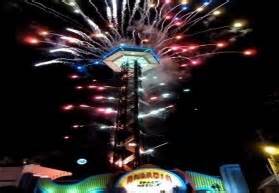 At the stroke of midnight on December 31, 2013, fireworks will blast off the rooftop of the 400-foot tall Space Needle with music choreographed for the show produced by Pyro-Shows of LaFollette, Tennessee. The Space Needle has added sequencing LED lights to the tower, making for a spectacular display. 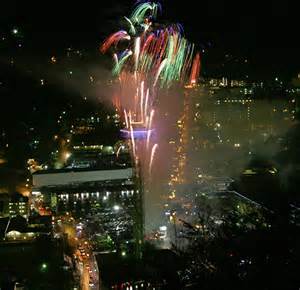 Leading up to midnight, there will be free music and entertainment in the parking lot adjacent to the Gatlinburg Convention Center. Actress Rachel Grant will host “Witness The Impossible,” a Las Vegas style stage show beginning at 11:00PM. SUPERHUMAN Chad Netherland and Mentalist Bill Gladwell will amaze the audience with an electrifying showcase of mental and physical abilities including; Man vs. Machine SUPER-BIKE hold, the Human Bullet Catch and stunning mental predictions.